Pictures of various wargame excursions. Sometimes updated, sometimes..not so much. We used Donnybrook rules to play out a fictitious engagement in 1689 which has the largely Dutch local militia in open rebellion upon arrival of news of the Glorious Revolution against James II. Units of militia seize the local fort. Upon hearing of the approach of regulars from Albany the militia promptly abandons the fort, retreats west into the woods but then doubles back determined to fight after scouts report the approaching force is smaller than anticipated and the already gathered militia force also expects to be reinforced as word of the rebellion spreads. It's at this point that our battle begins with the duke of York's independent company guided by a party of Indians & loyal frontier militia arriving at the fort. They make their way off the beach forming a skirmish line to engage the onrushing militia.The battle included a large running fire fight, infantry assaults and cavalry charges. Only after an entire day of fighting would the local militia grudgingly cede the field to the regulars. Rioting civilian mobs and local militia men rush towards the approaching regulars, some manning the redoubt west of the main fort. Local frontiersmen and allied Indians advance before the column of independent company soldiers. units of militia foot and horse rush forward. Militia cavalry charges into a band of Mohawks, chasing them back into cover. After the initial rebel assaults are repelled the regulars are eventually form a cohesive firing line. Their disciplined volleys take a heavy toll and repels the rebel attack. Late in the day the rebels finally bottle out and fail their force morale check (by 1 pip!) The mobs retire into the woods to lick their wounds and plot anew. I found myself drawn back to the 17th century due to the advent of recent skirmish level rule sets: Blood & Plunder, The Pikeman's Lament & Donnybrook. I'm putting a table together for a game of Donnybrook. Some pictures of Warmaster miniatures, terrain and some recent games. I'm looking forward to trying out Dan Mersey's the men who would be kings game rules. I have finished a few Afghan units composed of Old Glory & Perry minis and I treated myself to some new terrain. Wonderful Buildings and walls from Crescent root, great latex roads by Fat Frank and a cool cigar box battle mat. 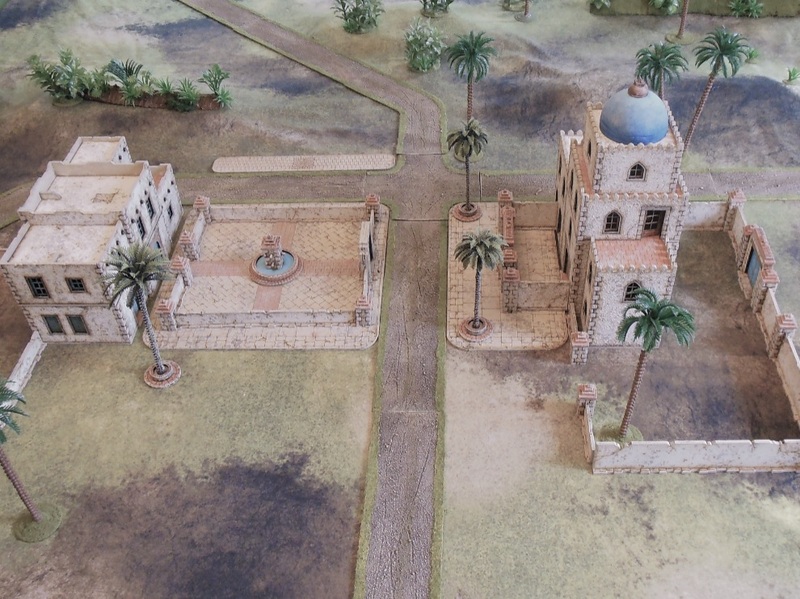 I have been building some 28mm terrain for a WWII pacific table. I'm working on a lot more vegetation but we have a good start and set up to play an 850pt per side game of bolt action pitting my USMC and Merrill's Marauders squads against my friend Bill's IJA. Bill handily won the game by shredding two Merrill's marauders squads in close combat. Unfortunately the lighting over my table is a little low so the pics are a little blurryI hope you'll enjoy some of the action shots from a very fun game. Gladiator Wargaming in 1/6 scale. 1/6th Scale WWII Lawn Gaming!